The New Orleans Marriott at the Convention Center has recently introduced a New Orleans hotel special created to give travelers the opportunity to give back and serve. Voluntourism is a growing trend among tourists, looking for the chance to help in community aid efforts such as Habitat for Humanity® and many more. This New Orleans vacation package offers special "Care Concierge", opportunities for hands-on community aid, donation to Habitat for Humanity® along with an every growing list of other aid organizations. As visitors are motivated by a desire to help the city rebuild, this New Orleans, LA riverfront hotel has designed a New Orleans vacation package offering guests the opportunity to lend a helping hand. Do something good with your summer and volunteer in conjunction with the Marriott New Orleans Convention Center Hotel. 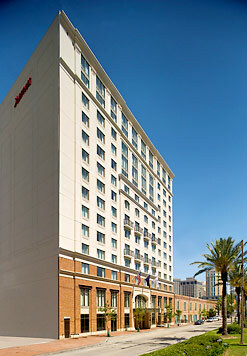 The New Orleans Marriott at the Convention Center is located in the Warehouse/Arts District, this New Orleans riverfront hotel is across the street from the Convention Center and Port of New Orleans, as well as within walking distance to the French Quarter, Harrah's Casino, and the city's finest shopping and dining establishments. Housed in a former cotton mill from the mid-1800's, this riverfront hotel in New Orleans expertly combines classic antiques with modern amenities and trendy decor. Indulge in luxurious accommodations, as well as fine dining at Wolfe's in the Warehouse featuring exceptional Creole cuisine prepared by celebrity chef Tom Wolfe. For more information or to make a reservation, call 504-613-2888 or visit http://marriott.com/hotels/travel/msymc. *Valid seven days a week through 11/15/08. Based on double occupancy and subject to availability. Some blackout dates may apply. Package price is non-commissionable. Limited number of rooms are available for this promotion. Tax is additional. Offer does not apply to groups of 10 or more rooms. Offer cannot be combined with any other promotions. Advance reservations required. Other restrictions may apply. Rates are per room, per night and based on availability at the time of reservations.